Photo by Robert Beck / Getty Images. The Olympic bronze medalist is preparing to win in Tokyo in 2020. Here, she shares how she approaches goal setting. After taking home the Olympic bronze in the 100-meter hurdles in Rio in 2016, Kristi Castlin is setting her sights on reaching new heights in the coming years. 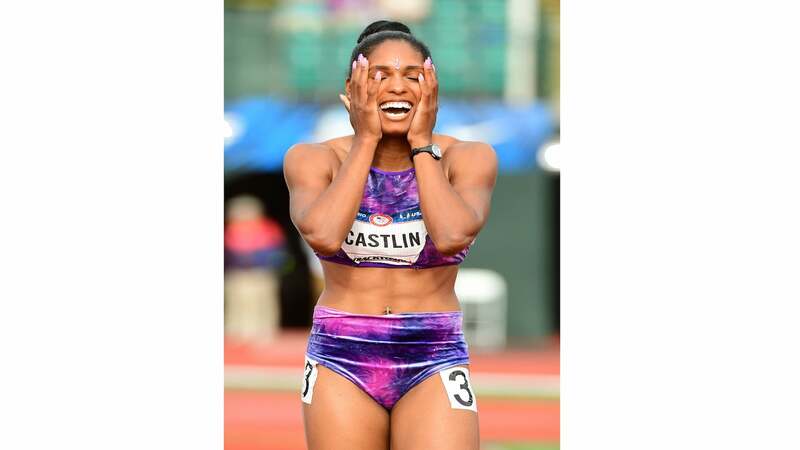 From taking time off when needed to making a comeback after long breaks, Castlin knows how to stick to schedules, set goals and relax just enough to stay on track. After facing difficult health issues in 2018, Castlin has returned to training for this year’s IAAF World Championships and is hoping to make it to the Tokyo Summer Olympics in 2020. In the meantime, she gave us a call to chat about her methods for goal setting and what she’s hoping to accomplish in Tokyo. How has life looked for you since you won the bronze in Rio? Immediately after, it was a lot of ups and then it kind of went down for a bit—we didn’t have a major championship [in 2018]. This year we actually have the World Championships in Doha, Qatar in October, so I’ve been getting ready for that. And then, of course, Tokyo is just around the corner. Did you take any time off? Well actually, this past year during my time off I was faced with a few obstacles because I found out that I was dealing with endometriosis. So physically, I was in a lot of pain all the time, so I actually took that next step and had a small surgery. Really 2018 was one of my hardest years. A lot of women deal with endometriosis—it must have been even harder to deal with it as a professional athlete. Yeah. I still have to deal with some of the symptoms, but now it’s a little bit better because of diet and exercise. I’ve been able to regulate things more [from] really kind of just knowing what I’m dealing with. It sounds like it was important for you to take that time off and figure out what was going on with your body. What process do you recommend athletes use to set goals for themselves after taking time off like that? That’s why I say it’s kind of three-tier because I feel if I’m just looking at the overall goal of becoming an Olympic gold medalist, that’s overwhelming. Whether it’s day by day, week by week—if I can see improvements here or if I can check things off my list, Olympic gold medalist will be a byproduct of me checking [those] smaller goals off. What’s your stance on rest days? Everything I do is kind of dictated by my coach. Sometimes I’m begging him for an off day. I definitely do take my off days really seriously. I’m a spa girl. [Since I train] nine months out of the year, doing nothing is my way of recharging. Even when some athletes take time off, they’re still running or they’re still cross-training or doing something. Me, I’m not doing anything. I’m just letting myself mentally regroup, physically regroup, and when it’s time for me to actually start back, I’m already kind of refreshed and rejuvenated because I’ve allowed myself to have so much time off. Rest is so important. But how are you feeling looking ahead to Tokyo? What are you most looking forward to over the next year and a half before you get the chance to go for that gold? I’m most looking forward to, believe it or not, just telling my story more. I think a lot of people are excited about the Olympics, and they’re excited about Olympians and the glory, but I think more often than not, I am constantly asked, “How do you become an Olympian? How do you get there?” I think I’m most excited about sharing my story and giving a lot of people who supported me in 2016—and maybe even those who are looking to support me now—more insight on what it really takes to become an Olympian. How this journey is, how it feels. I specifically have a passion for young women, so just [allowing them to] see a little bit more of themselves in me.